With more than 230,000 veterans living in the city, New York is in a unique position to become a municipal leader on veterans’ issues. On December 10, 2015, after a two-year battle with Mayor Bill de Blasio, the future for veterans in New York City changed forever with the signing of bill 314-A into law, establishing a permanent city Department of Veteran Services. The creation of this department was first presented to Mayor de Blasio by IAVA in October 2014 as part of a comprehensive set of policy recommendations for New York City’s veterans. Over the past two years – and in spite of continued opposition from the Mayor and NYC Veterans Affairs Commissioner Loree Sutton – IAVA remained committed to ensuring NYC veterans received the care and support they earned and deserve. NYC’s Department of Veteran Services must be appropriately funded annually at $100 million to support the city’s 230,000 veterans and their families. The veterans community fought long and hard for a permanent department that would forever be a resource for veterans in need. The de Blasio Administration has yet to present a comprehensive plan for our veterans. The piecemeal approach currently in place to address vital veteran needs like unemployment, homelessness and mental health care doesn’t work and isn’t effective. The Mayor needs to champion a plan that: helps combat veteran suicide and support mental health initiatives; strengthens the city’s government for today’s veterans; defends military and veteran education benefits; better employs the New Greatest Generation of veterans; and increases support for veterans and their families. 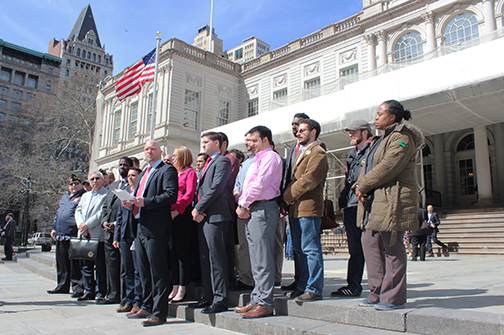 A good starting point for all of these issues is IAVA’s policy recommendations for New York City veterans. Want to help fight for NYC’s veterans? Join IAVA at iava.org/#join. Membership is free and open to all veterans and civilian supporters.